The iDVR-PRO8H is an 8 channel hybrid CCTV system DVR that works with traditional analog CCTV cameras, HD BNC security cameras, and network IP cameras. This DVR is known as a hybrid-type because of the different security camera technologies that are supported. Each channel of the DVR can simply be configured to use any of the following camera types: analog CCTV, AHD, HD-TVI, or network IP camera. You can learn more about this hybrid technology here. The iDVR-PRO8H is capable of recording on all eight camera channels at 30 frames per second at all supported resolutions, including full 1080p. In the video surveillance industry, 30 frames per second is sometimes referred to as real time recording. The iDVR-PRO8H DVR supports recording at 240 FPS total (which is 30 FPS x 8 cameras). The iDVR-PRO8H is a Linux embedded / stand alone CCTV DVR. 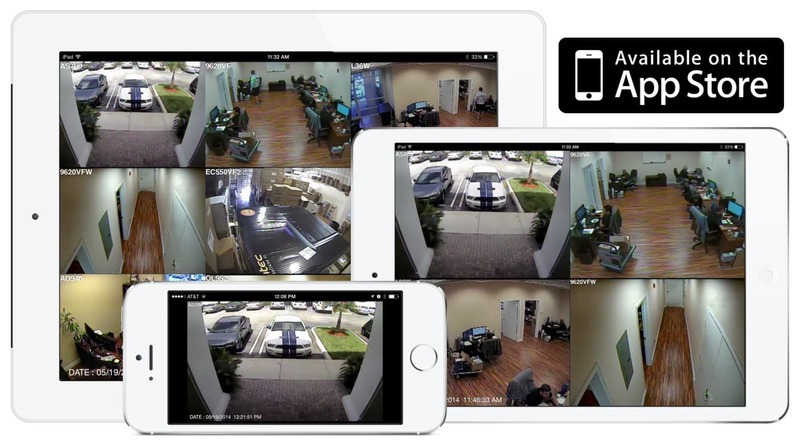 iDVR-PRO surveillance DVRs include some of the best software applications remote viewing from iPhone, iPad, and Android mobile devices. The web browser and software applications for Windows and Macintosh computers is also excellent. iDVR-PROs included a mouse and wireless IR remote control that is used to access and control the intuitive and easy to use user interface. The iDVR-PRO "H" series DVRs use the exact same software interface and client applications as the "A" series. The main differences with the "H" series is the ability to add a DVD burner, 5 hard drive bays, one audio surveillance input per camera input, additional BNC spot monitor outputs (2 spot outputs for this 8 channel model), 16 alarm inputs, 8 relay outputs, and 8 digital alarm outputs. Spot monitor outputs are commonly used in retail stores to display live camera views at entrances so store customers are aware that the store is monitored by video surveillance. The spot outputs can be configured to display a grid of 4 cameras each or a single camera view that scrolls between all camera views. Learn more about the spot monitor functionality here. These DVRs come with a 2 year warranty and lifetime USA based technical support, both of which are provided directly from CCTV Camera Pros. The robust features and sleek design make the iDVR-PRO DVRs one of the best choices for home, business, and government video surveillance systems. 2U Size Case - 16.9" x 14.5" x 3.5"
The iDVR-PRO8H is a hybrid DVR that works with the BNC security cameras and network IP cameras. The following security camera types and resolutions are supported. Network IP cameras - 2mp, 3mp, 4mp, 5mp IP cameras supported. IP cameras must support standard ONVIF video protocol. Analog CCTV, AHD, and HD-TVI are all BNC security cameras that use the same RG59 coax cable to run video from the camera to the DVR. Network IP cameras must be connected to a switch or router using CAT-5 or CAT-6 network cable. The DVR must be on the same network as the IP cameras. Users can mix any and all of of the above security camera types. Each channel can be configured for a different camera type. Would you like to demo an iDVR-PRO before you decide to purchase one? CCTV Camera Pros has a demo surveillance system setup at our office using an iDVR-PRO and a variety of CCTV cameras that we supply. We will supply you with login information and instructions so that you can see what the user experience is like when you remotely access an iDVR-PRO from Mac, Windows, iPhone, iPad, and Android devices. If you need support along the way, we will provide you with help. The spot monitor function on this hybrid CCTV DVR is one of the features that make it unique. There are two HD monitor outputs: HDMI and VGA. Users have the option to choose a dual monitor setup which mirrors the two displays and both will display the menu system of the DVR. Users also have the option to setup one of the outputs as a spot monitor, which hides the DVR's menu system and only displays a live security camera view. iDVR-PRO has the most advanced spot monitor configuration. Watch the above video to see how easy it is to setup custom camera layouts in the spot monitor. You can learn more about the iDVR-PRO app for iPhone and iPad here. The above screenshot shows the iPhone app for an iDVR PRO in playback mode. The user is viewing recorded video with 4 cameras on the screen. Click here to see additional images of the iPhone app in live and playback mode. The above image shows an iDVR PRO being accessed on a Mac via the Chrome web browser. The web browser access supports single camera viewing only. Users can select which camera they want displayed via a dropdown box on the web page. 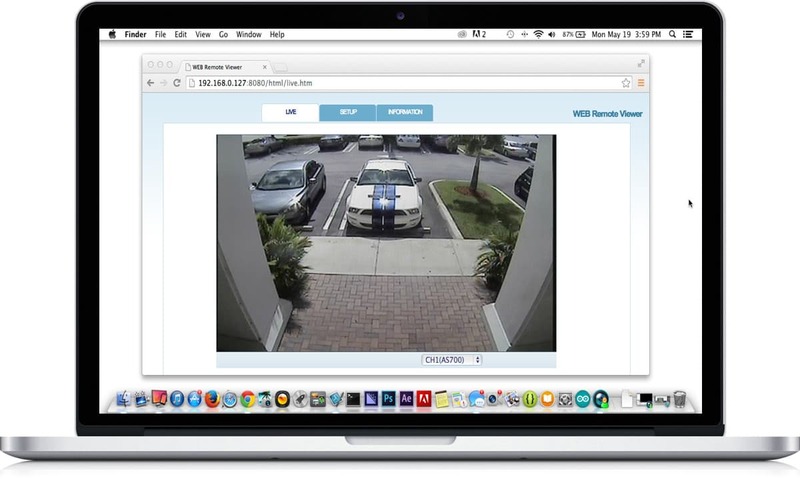 The web browser view also supports accessing the DVR's configuration, PTZ camera controls, and viewing the event log. NOTE: The video conversion to YouTube degrades the quality of the video. Actual surveillance video viewed on an Android device is even better than what is seen above. Be sure to select 1080p video during playback in the YouTube player.